Draws together educators from across the UK who call on all those working with young people in schools to adopt a more enlightened and empathetic approach to children in challenging circumstances. When it comes to the education of children living in poverty there has been a great deal of talk about grit, resilience and the drive for social mobility. Yet such terms not only reflect merely a fraction of the wider story, they are also part of a narrative which puts all the onus on young people to ‘pull themselves up’ or else accept their fate among the ranks of the ‘feckless poor’. 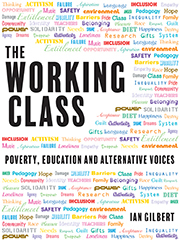 In this unique collaboration, drawing together educators from across the UK and further afield, we challenge this destructive narrative and call on all those working with young people in schools – from policy makers to teachers and school leaders – to adopt a more enlightened, empathetic and practical approach to support all disadvantaged children. Contributors include: Jaz Ampaw-Farr, Al Aynsley-Green, Paul Bateson, Phil Beadle, Ceri Brown, David Cameron, Darren Chetty, Sameena Choudry, Shona Chrichton, Paul Clarke, Tait Coles, Mark Creasy, Paul Dix, Ian Gilbert, Julia Hancock, Crista Hazell, Jane Hewitt, Martin Illingworth, Nina Jackson, Gill Kelly, Debra Kidd, Chris Kilkenny, Jonathan Lear, Roy Leighton, Ian Loynd, Brian Male, Mathew McFall, Rhythmical Mike, Kevin Ming, Andrew Morrish, Jarlath O’Brien, Sarah Pavey, Louise Riley, Hywel Roberts, David Rogers, Will Ryan, Daryn Egan-Simon, Leah Stewart, Tim Taylor, Jamie Thrasivoulou, Brian Walton, Mick Waters, Steven Watson, Dave Whitaker, Floyd Woodrow and Terry Wrigley. Ian is an award-winning author and editor, a leading educational speaker and entrepreneur and a man who the&nbsp;IB World&nbsp;magazine named as one of its top 15 educational ‘visionaries’. He established Independent Thinking in 1994 as a platform for leading practitioners to share their work in bringing the best out of all children. Currently based in Hong Kong, he has lived and worked in the UK, South America and the Middle East and so has a special perspective on classrooms and systems, what works and what definitely doesn’t.